I was raised and confirmed in the conservative Lutheran Church – Missouri Synod in northern Indiana. This is not to say I was an exceptionally good child. I was probably more profane than most, got in more trouble than many, and fought many a Sunday morning battle with Mom over whether I had to go to church, the equivalent of a city block away from our rural home. Religion was not a subject a person would ordinarily talk about. It felt awkward. In the summer of 1971, after my sophomore year of high school, I started reading the Psalms in the Bible, and continued into the book of Proverbs. I’m not sure why. I had heard of Jesus Christ Superstar, but I don’t recall being particularly oriented toward that sort of thing. Maybe I was just curious. Psalms and Proverbs would have been relatively safe for me: they didn’t have the overly religious feel of the familiar old stories about Moses and Jesus and such. This Bible reading may have predisposed me to be interested when my friend Neal told me (probably while we were hanging out outside the church building rather than submit to the deadly tedium of another Sunday service) about the so-called coffeehouse, the Adam’s Apple, run by Calvary Temple, in Fort Wayne. I went with Neal to Adam’s Apple for the first time that October. It quickly became a habit: for much of the next two years, I attended the Apple frequently and Calvary Temple occasionally, to my parents’ dismay. It was not their brand of religion. Dad, in particular, felt that Calvary Temple was run by a fraud. Adam’s Apple put a whole new face on Christian belief. In stark contrast to the stiff religiosity on display in the pews of Zion Lutheran Church, people at the Apple would hug each other. There (and sometimes at other places in the vicinity), a young audience would sit on the floor and listen, laugh, clap, and pray while regular musicians like John Lloyd and Nancy Henigbaum (“Honeytree”), and guests like Phil Keaggy and Larry Norman, would play. I’ve posted a video that captures some of the sounds from that place. 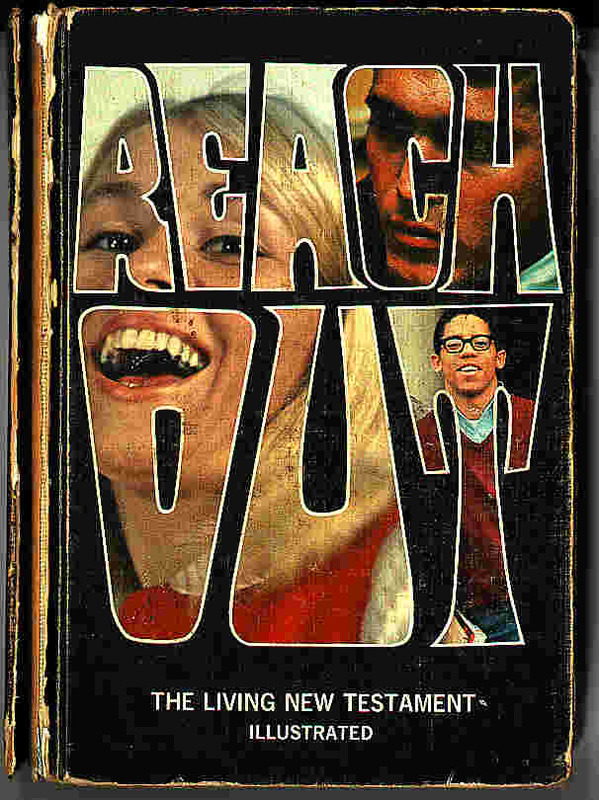 Pentecostalism can be pretty heady: speaking in tongues; saving souls for the Lord; believing that the Devil is constantly trying to snare you; telling my high school composition teacher that I was not going to college because the world was going to end soon. I could not waste time on flawed human knowledge when there was so much important work to do for the Lord in those End Times. I was street-witnessing (i.e., stopping passers-by to ask if they had found Jesus), not only in nearby towns, but also as far away as Dayton, Ohio (with the Adam’s Apple group), Indianapolis (with Campus Crusade for Christ), and the Warren Dunes in Michigan (on a church youth group camping trip). I had my Dake Bible; I read it from cover to cover a half-dozen times, and investigated countless cross-references among Bible passages; I memorized several of the shorter New Testament books verbatim. They called me Preacher Ray, there at DeKalb High School. A second vision came to me this summer . It is a vision of five tragic calamities coming upon the earth. . . . Never again in the history of the world will there be a time of complete confidence and trust in world economies. . . . I see a time coming when nearly all evangelical missionary projects, all religious radio and TV programming, and all incorporated missionary societies will be so closely monitored, questioned, and badgered that they will be cautious of expanding in any area. The passage of 40 years has made clear that what Rev. Wilkerson predicted would occur “soon” did not, in fact, occur. Anyone who has lived through these four decades since 1973 – who has seen the Dow Jones Industrial Average keep hitting higher and higher peaks, who has witnessed presidential elections being heavily influenced by the Christian Coalition, who has observed the rise of the megachurch – may be inclined to question Wilkerson’s claim that God showed him the future. This certainly was not someone who zeroed right in on exactly what was happening, as one would expect from a prophet of God. At the time, though, Wilkerson and other eschatological predictions convinced me that it would be foolish to invest years in college or otherwise to build a career, a home, or a future, when Jesus was going to be coming back very soon. Notwithstanding this impact on me, Wilkerson was better known for The Cross and the Switchblade, about the positive impact of the gospel on the life of former New York gang member and heroin addict Nicky Cruz. I met Nicky Cruz, when his touring took him through Indiana, and found it very exciting that the Lord was changing lives like his. There were other dramatic developments in the Christian press around that time. The most electrifying story of doing battle with the Devil emerged in Mike Warnke’s Satan Seller. Warnke told of his extraordinary experiences as a Satanic high priest in southern California, before he found Jesus. He described how the Devil gave him power to cause buildings to burn by putting a hex on them (pp. 74-75), and to order demons to torment people and cause car accidents (pp. 105-106); he said that he had even witnessed astral travel (i.e., the instantaneous transfer of a woman into his living room, and then away again) (p. 87). Warnke’s fraud would finally be exposed, many years later, by Christian journalists. But at the time, stories like his and Wilkerson’s fed both my commitment to God and also, over time, a subtext of uncertainty. There did seem to be a dramatic difference between their experiences and mine – a difference that I was unable to surmount despite enormous efforts in Bible study, self-scrutiny, prayer, and fasting. For some reason, I was just not having out-of-body experiences, seeing visions, or otherwise encountering firsthand the incredible supernatural power that people kept telling me about. I did, however, have a different type of experience reminiscent of Wilkerson and Warnke. One time, years later, in a discussion with my co-workers in a Mormon-owned photocopy shop on upper Broadway in New York, I heard a very apt phrase. It was not one that we evangelicals had used, but it did speak to the problem. That phrase was “lying for the Lord.” I knew the experience well enough. As I discuss further in another post, we who tried to persuade people to join our religion would often make claims that weren’t true, or would advance arguments that did not jibe with our own beliefs and our actual experiences. For instance, we would tell people that they could place their burdens on God, that Jesus would give them clarity and peace. But if they did take our advice and ask Jesus to enter their hearts and lives, they would soon find themselves transitioning into a Christian lifestyle of complexity, struggle, and anxiety. No peace for you! There was the Devil to worry about, as just noted, and the End Times developments in the daily newspaper to speculate upon; there was the Bible to read and interpret and apply, and assorted faith-related interpersonal complexities to deal with, and temptations to fight, and things to pray for, and anti-Christian schemes to detect, and so on ad infinitum. You would seriously not believe the number (and the astounding, frequently preposterous range) of things that seemed to be going on in the heads of myself and (even now) my Bible-believing Christian friends. Of course, there are all kinds of people in this world. There are calm people in every profession, every religion. Generally, though, our worldview was not a path to Bob Marley-type mellowness. Yet we went right on speaking as though our lives did prominently feature an idyllic peace – and, adding to the stress, we expected ourselves to be enjoying that sort of thing, even when there was no reasonable prospect of it, given the many things we had to worry about. And yet, on the occasions when we did happen to experience a bit of it, we saw it as proof that we were on the right track. Part of the explanation, I think, was that we were not allowed to doubt, and as a result we did not tend to critique our own upbeat claims about faith. This meant that, in the spirit of Wilkerson and Warnke, and perhaps as an unwitting invitation to habitual liars, we really didn’t have many constraints on telling people whatever might sound good. It was supposed to be like that for us; it was going to be like that for us; we just hadn’t quite gotten there yet. Despite these shortcomings, let me emphasize that being a born-again Christian teenager was a fantastic experience — not in every way, but definitely in some important ways. I have never experienced fellowship like that which I experienced in our high school prayer group. Some of it was definitely mixed up with naivete and virginity; it was probably more fun for me than for some, given my status as an informal leader; maybe it resonated for me particularly, as an echo of the insular community of my childhood; but, still and all, it was special, and most of us seemed to be together in it. On that foundation, temporary though it was (with many of us pairing off into couples, approaching graduation, and otherwise eventually drifting away from the shared group experience), we had some really great social and spiritual times. For starters, when I stopped going to my exploratory teaching gig in a nearby elementary school (in a profound fit of senioritis that the high school’s administrators never did detect), I discovered that I was left with a 100-minute lunch period. The other members of our prayer group would cycle in and out of the cafeteria, according to their individual schedules; but I was there the whole time, anchoring our group’s table and getting to see virtually every other member of our fellowship on a daily basis. Talk about redeeming the time! My expanded lunch break did not seem to irritate any teachers, as I had done when Mr. Stackhouse discovered that my midafternoon independent study hour was functioning as naptime in the library. In all regards, this extended luncheon opportunity provided an edifying social addition to my high school experience, and of course I must enthusiastically recommend it to future high schoolers. It was also really special to have a life of semi-mystical experiences — looking up at the nighttime sky and thinking about God and eternity, believing that shooting stars signified love between me and the preacher’s daughter (don’t ask me where I got that connection), finding meaning in the sunsets and the trees and the waters. Everything was so rich. Sometimes even the secular song lyrics were like words directly from God: “Are you reeling in the years / Storing away the time.” Admittedly, some of the most intense experiences were on the dark and spooky side, involving the power and presence of Satan that many believers seemed so preoccupied with. Was I really alone, late on a snowy, moonlit winter’s night, as I warmed myself in our darkened kitchen? In all this fellowship, I had experiences I have not had since, like when four of us guys got together, all with guitars, and spent a night singing and praying, talking and thinking, in an empty church lit only by a candle. There was another unchaperoned all-nighter, sponsored by a local church for the benefit of a couple dozen Lutheran high schoolers; but this time our adventures ran the gamut from solitary prayer in the sanctuary to rambunctious physical games (not limited to hide-and-seek) around the church grounds. Somebody probably caught hell for letting us tear the place up like that. And yet, on another level, this stuff pretty much kept me out of trouble. Of the three country boys I was hanging out with before I got the Jesus fever in my junior year, one is dead, one suffered serious brain injury in a suicide attempt, and the other nearly died in, and is profoundly impaired due to, an alcohol-related automobile crash. I might have survived anyway, without the Christ-oriented lifestyle, but then again I might not. So those were some aspects of my experience as a born-again believer. Meanwhile, for better and worse, life went on. After graduating from high school in May 1973, I took a job, running a drill press in a local factory. In my free time, I was dinking around on my guitar, reading the Bible, and hanging out with fellow Christians. My parents were afraid that I was not going to get a proper education. Finally, in August 1973, Mom told me that they would pay the tuition if I would attend a Lutheran college. Some months earlier, I had visited what was then Concordia Lutheran Junior College in Ann Arbor, Michigan; but, as noted above, I had decided not to apply. But in late July, the union organizer at the factory demanded a decision on whether I was going to pay the membership fee and join the union. I thought about it and finally said no. Despite enjoying the occasional horseplay, I was a very diligent and productive worker, and that did not seem to impress the stolid union members who had been standing at those machines for years. It was not the place for me. I was going to have to find a new job, or something. So now, as other recent grads started to peel off for their various campuses, it seemed I had probably better rethink this college thing. With just a few weeks of summer left, I applied, was accepted, and entered Concordia’s pre-ministerial program. Concordia was certainly a religious place, but it was not pentecostal. I don’t remember exactly how that struck me. I will have to try to reconstruct the situation sometime. I think I must have been transitioning to a more thoughtful kind of belief, perhaps in reaction against the more dubious aspects of the Jesus movement. For whatever reason, I suddenly rediscovered an interest in being a good student, after years of a public school mental hiatus since leaving the one-room schoolhouse. Being at college, or perhaps being able to study religion, motivated me to take extra courses and also to test out of a couple of classes. Through such efforts, I completed most of the coursework required for the two-year degree in that one year. So there was no point staying around for a second year, accumulating credits that would not move me closer to a bachelor’s degree. Several years later, I sent Concordia a transcript from elsewhere; they granted some transfer credits; and on that basis they awarded my associate’s degree. So now that I was finishing that first year at Concordia, there was the question of where to continue my education. I decided to transfer to Indiana University (IU), where I would qualify for in-state tuition rates. There, I continued in my ministry-oriented studies: I enrolled in second-year courses in German and ancient Greek, started Hebrew, and also took a couple of philosophy courses and a course on the New Testament. That New Testament course at IU would play a pivotal role. As I discovered, people did not necessarily take an evangelical view of the Gospel in that big, secular university. I suddenly found myself as the stereotypical Bible-thumper, raising my hand to explain to the religion professor (Dr. Sampley, as I recall) how he did not have the proper view of Jesus and the biblical text. He was an agreeable guy, ready to listen to what I had to say. After class, on a couple of occasions, I gave him fundamentalist tracts and other materials to read, so that he would understand where he was mistaken; and then, after the next class session, he would explain to me why my materials seemed to be leaving questions unanswered. The reasonableness of his approach threw me off balance. By midway in that fall semester, it was beginning to seem pretty obvious that I had taken a lot of things for granted. I had just accepted the Bible as being straightforward and obvious, and was now discovering that people who did not come from my religious background might not share that impression at all. That was extremely disconcerting. I did understand the professor’s reservations. So it was not, as I had imagined or had wanted to believe, a simple matter of introducing people to God and letting the Holy Spirit work magic in their hearts. There were also these intellectual issues. And I did not have answers for them. I had not been certain how my pre-ministerial education was going to play out anyway; now it began to appear that it might not play out at all, certainly not until I could get past these barriers to faith. Meanwhile, the previous summer, I’d had an experience that threw another wrench into my college education. I had taken the Greyhound bus to suburban Los Angeles, and had stayed with my older sister and her husband — along with my older brother, who had moved out there to join them some months earlier. That had been a lot of fun. So now, as the Indiana skies turned literally and spiritually gray and cold for me, it seemed that I might as well do my spiritual rethinking in sunny southern California. With a considerable sense of academic failure, I decided to drop out. When I told the religion professor of this decision, on my last day in his class, he looked at me and said just one word: “Courage.” His way of wishing me luck. A cool dude, all around. So I left Bloomington and caught a train for the coast. But life is never simple. In L.A., it develops that my sister is letting two godforsaken Jehovah’s Witness ladies visit her living room on a weekly basis, and I am therefore obliged to argue Bible passages with them. Of all the irritants found in weird cults and heathen religions, I felt, this was perhaps the most annoying of all: that people didn’t have enough common sense and decency to recognize when their beliefs were just ridiculous, and were thus unable to straighten themselves out. These weren’t intelligent religion professors with compelling questions; these were just heretics who, in my view, were obviously misusing the scriptures. It was absurd that these people actually claimed that *I* was the one in error. My arguments didn’t have the least effect on them. So I got exposure to a different kind of reaction to the Bible: that not everybody who reads it is going to be a rocket scientist, and that some of the rocket scientists who do study it extensively will come up with unexpected and incompatible interpretations that their followers will cling to tenaciously. I shouldn’t convey an impression that these occasional interactions were the sole source of doubt for me. Doubt was an inevitable thread throughout those years. It had been convenient enough, back in high school, to dismiss the doubters and the heretics, the songs like “Spirit in the Sky” and “Jesus Christ Superstar” and Tull’s “Hymn 43.” The music was good, but the message was flawed; and besides, as I say, it wasn’t as stimulating as the more directly Satanic stuff, like the Eagles’ “Witchy Woman” and (so we imagined) almost anything by a group that would dare to call itself Black Sabbath. For me, the surreptitious, truly evil nature of doubt was captured especially well in C.S. Lewis’s Screwtape Letters. And yet, despite the romantic energy of these stimuli, over time the more corrosive kind of doubt was that of the everyday American life, out there in what I considered “the so-called real world.” People out there didn’t seem to have much interest in this stuff. For some reason, the Lord was simply not smiting any Sodom and Gomorrahs. I wasn’t seeing plagues; nobody was even coming down with the pox. It was as though L.A.’s endless strip malls and McDonald’s restaurants might have a better grip on reality than I did. Just in case, I did in fact get a job at a Mickey D’s, right there in my neighborhood. I also got a partial tuition refund from IU, slept on the floor in a utility room at my sister’s house, and saved my pennies for a flight to Switzerland. That next step occurred in February 1975. Switzerland was where an evangelical minister and thinker named Francis Schaeffer had set up shop, creating a Christian commune called L’Abri (French for “the shelter”), in Huemoz, a village up in the Swiss Alps. I had been reading Schaeffer’s book, True Spirituality, and I had come up with a long list of questions for him. So now I flew over to meet him. Unfortunately, he wasn’t there. It seems that, if you are raised in the middle class, with experienced travelers to ask (or, nowadays, if you have an Internet), you learn that you are supposed to arrange these things in advance. So now I know this. At the time, however, the only people I knew who had ever been to Europe were World War II veterans and one local farmer who had been in the Army in the 1960s. They hadn’t needed to make reservations. So I just figured I was going to Schaeffer’s place; he would be there; and I would ask him my questions. What happened instead was that I got to harass his assistant pastors, nice evangelical ministers who no doubt found me bothersome. My questions were apparently not easy to answer and, in fact, neither they nor the accumulated Francis Schaeffer materials in the L’Abri library (such as it was) seemed to have even begun to grapple with most of the things I was asking about. I was perplexed that these questions, some of which now seemed obvious, had apparently never even crossed the minds of these people who were supposedly advising thoughtful Christians from around the world. After hanging around L’Abri for a while, mostly living on bread and jelly (and tripe, my new discovery, which tasted good at first, after a couple of weeks without much real food, but didn’t taste so good when I bought another can of it), I finally got admitted into L’Abri’s program of study, which I could have waltzed right into if I’d made reservations like the American Christians who had done this properly. But they still had to pay as much to live in one of the L’Abri buildings as I was paying in my humble hostel a few blocks away, and they also had to slave in the communal garden. Since there did not seem to be any prospect of getting answers to the questions that had taken me there, it seemed time to move on. One of the other Americans was also leaving town, heading back to his mom’s home in a fishing village called Looe, on the English Channel, in Cornwall. I invited myself along with this guy, name of Ron, and that was the end of L’Abri for me. As it turned out, Ron’s brother was named Randy; Randy spent all his time in his room with his guitar and a huge tape recorder, trying to prepare an album for a record company up in London; and a couple years later, one day in New York, I turned on the radio and heard Randy VanWarmer singing “You Left Me (Just When I Needed You Most).” Ron later told me it hit No. 3 on the pop charts. Eventually, Randy even had a Greatest Hits album. So, you know, good for him. After several weeks of thinking, hiking along Cornwall’s craggy cliffs, and debating, alone and with Ron, I landed back in Chicago with about $10 in my pocket. I took the South Shore railroad as far as I could, and then hitchhiked and walked all night to make it to my folks’ place north of Fort Wayne. Before flying to Switzerland, back in February, I had driven from L.A. to the folks’ place; but then, too caffeinated to sleep, I had decided to drive over and see a friend. That was not a judicious decision. I fell asleep on the way and hit a tree. Kind of a close shave: awoke at the last second and cranked the wheel, thereby shearing off a fender instead of my head. So now I had to repair the VW and head back to L.A. When I did get back to Los Angeles, my sister’s husband wasn’t terribly eager to have my brother and me stay there anymore. It was time for us to find our own places. Maybe I could have done better than my new job at another McDonald’s, or at least I could have worked two jobs to afford an apartment. But I was still concerned about spending eternity in hell for my doubt, and was thus still devoting a huge amount of time to Bible reading and agonizing over the logical inconsistencies I was finding in the Bible and in the commentaries of Christian writers. I was still attending various churches from time to time, hoping that maybe I was overlooking something; maybe somebody would have answers that would clear up everything and prevent my concept of Christianity from being simply false. In a bid to make more than minimum wage, I bought a couple of run-down VWs and gradually fixed them up to resell. My finances would basically cover rent for a garage on Cherry Avenue in North Long Beach, where I could do autobody repairs on one car indoors while leaving the other outdoors. The indoor car kindly shared space with me. I had a couch in there, one that Bob (a fortyish Volkswagen mechanic) and I had rescued from the alley behind his house, and I slept on that. I had a board propped up on some crates; I used that as my desk. There was a bathroom at the Douglas Burger down the street, not to mention a cute redheaded employee whom I was too shy to approach. Once in a while, my brother, living downtown, would let me use his bathtub. For about three months, I lived in that garage. I spent many hours rereading and rethinking Bible passages. I wrote out my thoughts, hoping that seeing them in black and white would make things clearer. I kept trying to figure out a solution, but eventually realized there just wasn’t one. As detailed in another post, I was trying to make the Bible into something that it wasn’t, something that it didn’t even claim. Like many fundamentalists, my faith was more in the Bible than in God. Behaving like the religious experts that Jesus warned against, we had converted the writings of ancient writers into legalistic texts, adding chapter and verse numbers that God had apparently forgotten to include. And we used that revised text to place burdens on people that they could not bear, like those described in this post — burdens that intelligent, goodhearted people would appropriately reject. We went through all kinds of mental gymnastics to try to persuade ourselves that the Bible, a patently flawed book, was perfect. We did that because that’s what we wanted, not because of any specific instructions from God. We held to this approach even though it required us to ignore the Bible’s obviously imperfect processes of formation, transmission, and translation. We basically decided to accuse God of something inconsistent with his supposedly perfect nature. It was like the police charging a man with a crime when everyone could see that he was nowhere near the scene. In the end, we made God look like an idiot, and we took pride in behaving likewise. If there was a God, then this was blasphemy; it was just plain wrong. What I concluded was this: it was impossible for an intelligent individual to have an honest belief that the Bible was the literal Word of God. As a fundamentalist, I had essentially been telling people that God would put you in Hell for all eternity if you earnestly sought the truth and faced up to the problems that I had encountered. In the end, I concluded, that was not right. There might have been a god behind that sort of threat; but if there was, it was not a good one. If anything, it seemed that we, in our pride and arrogance, had decided we were smarter than the Prince of Darkness; that we had been completely fooled; and that we were doing all this hard work just to make things worse. We wouldn’t listen to reason, and that made us the perfect patsies for whatever nonsense might come trundling down the pike. As described above, I had been trying to find a way out of this for quite a while, and I was continuing to devote a lot of time to it. But at a certain point, I just couldn’t afford to do that anymore. Along with the ongoing emotional and intellectual turmoil, my financial situation was desperate. I got a nudge on Christmas Day, 1975. I got sick, maybe because of the autobody chemicals, and the Douglas Burger was closed. I found myself barfing in the alley back of the garage. It was a moment of clarity. More than four years had passed since my first visit to the Adam’s Apple. During those years, I had experienced excitement and fellowship, and also theological study and religious disputation. During the past year especially, I had confronted and endured emotional upset: a fear of losing both my eternal salvation and all those marvelous experiences and beliefs. The trip to L’Abri had been an extraordinary yet failing effort to obtain answers that a divinely inspired scripture would have made plain — and now the encounter with L’Abri itself was nearly a year in the past. The essential facts were before me. I did not seem to be overlooking anything significant. It was time to decide how to proceed. And after that Christmas Day experience, I did proceed. Within a few weeks, I returned to full-time college student status, at California State University, Long Beach – once again taking philosophy and German courses, but this time without religion. Ultimately, my religious beliefs coalesced into agnostic polytheistic fundamentalism. It seems incomplete, does not contain the important questions you had and I hope you have another revolution. Follow the link to see the questions. I came to my conclusions when I realized that hell is not logical. It does not make sense that an all-loving God would create us, and then let us burn in an eternal lake of fire. Once I realized hell was created by humans to use fear to control the masses, I wondered what else in the bible was wrong. I wondered what manna really was. How did it grow so fast overnight. Then I figured it must have been some kind of magic mushroom. That would explain not being hungry, wandering around not caring about being lost, and the visions. A burnt bush does not turn back into a green bush. Once burnt, always burnt. Sticks do not turn into talking snakes. The laws of the the earth don’t change just because someone feels close to God. But under the influence of mushrooms, a talking snake can appear very real. The bible was written by humans. God did not write any of it. When I came to understand that it was not really God’s word, I no longer felt guilty for not believing most of it. I no longer felt guilty for not believing in hell. I realized I had no religion, and I didn’t feel guilty about that either. I decided that spirituality and religion are not the same thing. I consider myself a spiritual person. I believe in a Creator, and I believe that we will all go back to the Creator and become one wonderful massive being. How we get there, the paths we choose, the time it takes to get there is what varies. Are we in purgatory now? What if we lived some other kind of life before, here or elsewhere? What if, at the end of some previous life, we were in a state of being where we realized we were not yet ready to become part of the one being we call heaven. What if we knew we had to try again to be worthy of our final destination? What if we knew we had to choose another lifespan on earth to make ourselves more ready for our reward? What if we had to choose a life about to unfold on earth, and our souls entered a baby at the time of birth. No wonder babies cry, maybe they know they have embarked on another tough journey, hoping it will be their last. I’ve wondered some of those same things. I have to say this…I am a woman who has not been indoctrinated in anything. I am of sound mind when I say this. I was out living in Las Vegas…doing all the things you do in LV and I began having visions. Not dreams…but visions. As the years have slid by (5) to be exact….I had what I call “hells doors’ swing open on me and a friend. There was no denying it on our sides. A few years ago…in my visions…a presence showed up and it was this Jesus of Nazareth that everyone speaks of. It was him and there is no doubt in my mind. I have been in His presence on more than one occasion and I used to say….what??? why would you pick somebody like me? why not one of those holier than thou people? I dont understand it all…I understand enough to know He exists and so does the devil. I understand enough to know that most in churches don’t understand the very words that they read and preach. I know that I continue to have visions and sometimes it is Yeshua in them talking to me and showing me. I know that the things that he shows me …I write down in a journal and read about in the newspaper at a later time. I know that I cant lean on my own understanding but…. Jesus is very much alive, as well as the devil. I have a friend who was experiencing these things as well…and he was not a God hater but not a believer…he is NOW. that is how this happened to him..and myself. Amazing. Great report, Joan of Arc 77. Thanks for sharing! I’m with ya all the way! I enjoy your story, although it is a difficult one. I went through many of the same experiences on the road to becoming an atheist. One of the biggest challenges was realizing I didn’t have a soul. Re. just one question, the existence of God, I would encourage agnostic and atheist seekers (or just open-minded individuals) to check out a book written by the world’s best known atheist of the 2d half of the 20th century – Anthony Flew. He wrote it shortly before his death a few years ago, entitled “There is A God.” At first glance it looks like the title says “There is No God” but the “No” is crossed out with an A replacing it. Why the title? Because as the greatest philosophical atheist of his time (debating people like C. S. Lewis and G. K. Chesterton) he became a theist – and by his own admission was heading towards becoming a Christian before his death (I hope he made it). What convinced Flew that there must be a God? Two specific things: First, science has absolutely no explanation for the emergence of life from non-life. None! How could this have happened, he asked. And second, even if miraculously life somehow arose spontaneously from non-life, how could it then have replicated? How could this newly formed “life” reproduced – and not only reproduced but do so with increasing design as well? Flew argues, quite logically, that there must have been a Designer. Design mandates a Designer he explains in his autobiography. Great reading for any who care to examine his challenge. Listen to Tim Keller sermons. All your questions will be answered. One of the best philosophical theologians. Also, Dr. William Lane Craig, Alvin Plantinga, Norman Geisel, John MacArthur, RC Sproul, etc. are also good at explaining why you can trust the Bible as the inherent word of God. I spent years reading such things. As with this comment, they did not address the issues.